Our Gulf shrimp have a wonderful sweet flavor that makes them perfect for a vast array of dishes. Our fresh sea scallops have an endlessly buttery and sweet taste, whether they’re baked, sauteed, or broiled. Mild and white as the driven snow, these jumbo snow crab legs have an unmistakable sweetness and lightly chewy texture. Mild and white as the driven snow, these crab legs have an unmistakable sweetness and lightly chewy texture. I LOVE crabs! I can eat them steamed, in crab bisque, in crab cakes, and just plain old crabmeat. I often get crab legs at the grocery store to eat as a snack. But, the best ever crabs are Maryland Blue Crabs, steamed, and eaten with melted butter. MMMMMM…….. Melt the butter in a large skillet. When it is hot, add the chopped celery, onion, and garlic and sautee until the onions are clear. Put the sauteed vegetables in a mixing bowl. Add all the rest of the ingredients, and mix well. Put the olive oil in the skillet. 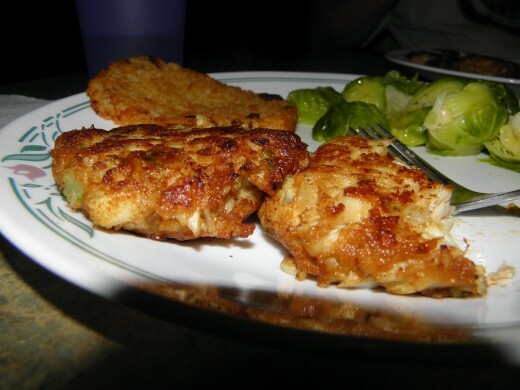 While the olive oil is heating, pat a handful of the crab mixture into a pattie, but don’t mash it to hard together. Place in hot oil. Fry until browned on one side, then turn over and brown the other side. Want something easier than that? Just try steamed Maryland crabs with melted butter. You can Buy Live Crabs Online or already steamed for even easier crab eating! My husband and I worked at a campground in Virginia right on the Rhappahannock River one year. We decided on working in Virginia because of the abundance of blue crabs, free for the taking, out of the river. It was one of the best seasons ever for me, because all I had to do is put some chicken necks in my crab trap and go back the next morning and there they were. 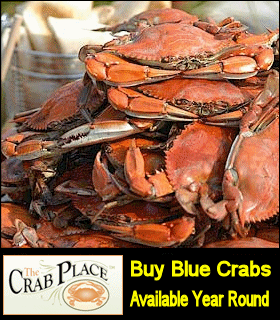 I was in a crab lovers paradise!To steam your own Maryland Crabs, you’ll need a crab steamer or large stock pot. I use a 16 quart pot. Put about 3 cups of water and 1 cup of apple cider vinegar in the pot, add 1/4 to 1/3 cup of your favorite seafood seasoning, and let the water come to a boil. Place the steamer basket in the pot, then throw in the live crabs, sprinkling each layer with seafood seasoning. Cover the pot and steam for about 10 minutes. Yummo!